Dr. Hopkins received a Doctor of Dental Surgery (DDS) degree from Georgetown University and has been in private practice since 1987. He is a member of the American Dental Association, the Maryland State Dental Association, and the Southern Maryland Dental Society. Dr. Hopkins continues to keep up to date with the latest advancements and technology in dentistry by continually attending seminars and courses to further his education. He provides treatment for patients of all ages and is dedicated to helping each of his patients preserve his or her teeth both in appearance and physical health because he believes that everyone deserves a smile of which they can be proud. 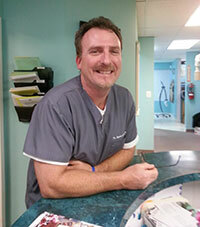 Dr. Hopkins resides in Germantown with his wife, Peggy, and their four children. Angela graduated from Allegany College with an Associate of Arts degree in Dental Hygiene in 1984. She received a Bachelor of Science degree in Dental Hygiene from the University of Maryland in 1995. Angela received her license to administer local anesthesia in Maryland in 2010. She has been employed with the practice since 2002. Angela resides in Mercersburg, Pennsylvania with her two sons, Benjamin and Jacob. Bobbie has been employed with the practice since 2001 serving first as a dental assistant and currently as the office administrator. She has over 28 years of dental experience. Bobbie graduated from the Hagerstown Career Studies Center in 1985 where she became a Certified Dental Assistant and received the Dental Chair Side Assisting Award. She is trained in expanded duties and holds a license in radiology. Bobbie resides in Hagerstown, Maryland with her husband, Phil. She has one son, Curtis. Kelli received her certification in Dental Assisting from the Southern Maryland Dental Society in 2006. She is trained in expanded duties and has been licensed in radiology since 2002. Kelli has been employed with the practice since 2005. She resides in Damascus, Maryland with her husband, Will and son, Paul.